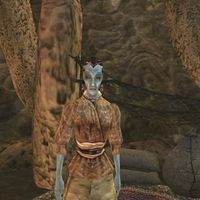 Balen Vendu is a Dunmer monk residing in her home in Sadrith Mora. She offers minor training in Athletics, Block and Hand-to-hand. She wears a common shirt with matching skirt. She carries a piece of paper and a small amount of gold. Aside from her natural resistance to fire and the sanctuary provided by her ancestors, she knows no spells. This page was last modified on 26 March 2014, at 14:13.